We had another great year in 2015. We’d like to say Thank You to all our customers. Our continued growth depends on people making the decision to use a luxury liver service with professional chauffeurs. As we celebrate our 30th anniversary, here’s a look at some of the interesting numbers that made up 2015 for us. 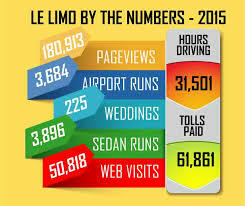 Whether it’s web site traffic or dealing with traffic on the roadways, Le Limo posted some big numbers. Tolls paid, hours driving, pageviews, airport runs, weddings, etc., all prove to us that we’re doing it right! If you haven’t used us yet, call 800-287-8970. We’ll help you Return to an Era of Unparalleled Luxury.